A: Structured cabling is the highway that information travels on in a building. The building can be large or small, commercial or residential, or a combination of both as in the mixed-use retail, commercial, and residential buildings now found in most large cities. Structured cabling systems are designed around telecommunications code standards to ensure that computer equipment will operate as designed when connected to the structured cabling system. Some of these factors include distance limitations, cable types, flammability ratings, and bend radii. Do I need Plenum or PVC? A: Plenum cable is designed to operate in a “return air” space in the building. Typically these spaces are above a suspended ceiling or beneath a raised floor. They are said to be a “return air” space because that is where the HVAC system gets the air to the heat or cool. If ever in question, the building inspector is typically the AHJ (authority having jurisdiction). Plenum cable is more expensive than PVC because of the less flammable compounds used in production. A plenum cable must pass a burn test that measures flame spread and smoke emissivity when exposed to flame of a certain intensity and duration. Do I need 1 or 2 cables per work area? A: This decision is a commonly debated topic. The fact is that the cable is very inexpensive relative to the entire telecommunications system and the building that it serves. The increased functionality and bandwidth that one additional data cable can provide at each work area outlet can prove to be priceless, especially after the drywall is in place. A. Manufacturers design and test their cable to perform at certain frequencies depending on the applications intended to run over them. Category 6, for example, is designed to be tested up to 250Mhz and provide a positive signal to noise ratio out to that frequency. This capability enables gigabit ethernet to run as intended over the cable with an acceptable amount of packet loss. Cat 5e, on the other hand, was only designed to 100Mhz. One should not get caught up in manufacturer claims of “tested to 350Mhz vs. 400Mhz”. The real question is “what is the signal to noise ratio at the frequency of the system you are running.” You can test barbed wire out to 1000Mhz, but it’s still barbed wire. What are test results about and why do they matter? A: Test results are commonly required on all structured cabling jobs. The installer can use a handheld tester that will plug into the network and test each cable run for wire map (correct pin out), distance, cross-talk, and ACR (signal to noise). These tests can then be downloaded into a file and handed to the owner after project completion. These tests provide verification of the system installation. What is industry standard for a warranty? A: Cabling system warranties are designed to take away the confusion between the cable manufacturer and the connectivity manufacturer if there is a problem with the system. In the early days of the structured cabling industry, there was mostly only one manufacturer that produced its own cable and connectivity solutions. Currently, there are several companies that own both and even more companies that have legal agreements in place to support a single solution and warranty design. Most connectivity and cable companies will tout a 25 year warranty. The truth is if the cabling system works after the contractor does his testing, it should last every bit of 25 years. The exception will be if someone does something to the system that materially alters or changes it. The electrons will not just “quit working” one day. What should the end deliverable be for a structured cabling system? What should I budget for my structured cabling project? A: Although we have this as our last question on the list, it’s sometimes the first question we are asked. Unlike most vendors, we welcome this question up front and we’re glad to provide as much helpful information as possible. From a rapid ball-park estimate to more detailed pricing based upon your specific needs and specifications, all you have to do is “Ask ASD”. In the meantime, we’ve created this FREE “Structured Cabling Purchasing Guidebook” for your easy download and reference. 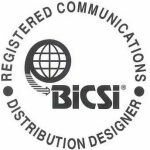 Those who achieve the RCDD designation have demonstrated their knowledge in the design, implementation, integration and project management of telecommunications and data communications technology and related infrastructure.